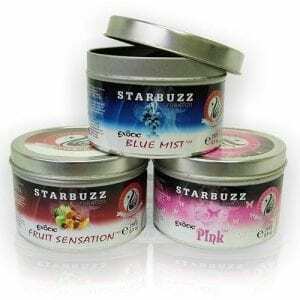 Starbuzz Flavors is one of the leading Hookah and Shisha Tobacco brands. Starbuzz has one of the biggest collections of shisha flavors. Starbuzz shisha is recognized and loved by all hookah lovers! Get ready to take your sessions on a new level with the best collection of Starbuzz Hookah tobacco. Make sure to check out the Starbuzz Blue mist (Starbuzz Blue mist review) which is the best selling Starbuzz flavor. However, make sure to not limit yourself to the Starbuzz blue mist, since there are countless of Starbuzz flavors to choose from! Starbuzz Flavors is one of the leading Hookah and Shisha Tobacco brands. Starbuzz has one of the biggest collections of shisha flavors. Starbuzz shisha is recognized and loved by all hookah lovers! Get ready to take your sessions on a new level with the best collection of Starbuzz Hookah tobacco.